Presenters: Brian J. Reiser, Professor of Learning Sciences in the School of Education and Social Policy, Northwestern University; Jeff Weld, Senior Policy Advisor and Assistant Director, STEM Education, Office of Science and Technology Policy; Dennis Schatz, Senior Advisor, Pacific Science Center and Field Editor of the journal, Connected Science Learning; James Blake, K-12 Science Curriculum Specialist, Lincoln Public Schools; Katie Van Horne, Ph.D., Assistant Research Professor, Institute of Cognitive Science, University of Colorado Boulder. Additional Presenters: Michael Novak, Adjunct Faculty, Learning Sciences and MSEd Programs Researcher, Center For Connected Learning; Grant Gardner, President-CEO, Assessment Services, Inc.; Deborah Tucker, Independent Science Education Consultant; Brian Carey, 7-12 Science Supervisor, Livingston Public Schools; Jodi Peterson, Assistant Executive Director, Communication, Legislative & Public Affairs, National Science Teachers Association; Larry R. Plank, Chair, Professional Development Committee, National Science Education Leadership Association. NSTA has negotiated special discounted room rates with the Westin Peachtree Plaza and 13 nearby hotels. Click here for a map of downtown Atlanta. To book your hotel room, click here. This is the current schedule of NSELA events to be held in conjunction with 2018 National Conference on Science Education in Atlanta. Please join us for as many events as you can fit into your conference schedule! Program Description: At no time in our country’s history has science education been more important than it is today. Whether it be addressing mankind’s grand challenges facing coming generations, or finding solutions to local issues tomorrow, science education leaders must navigate a shifting landscape all while owning the responsibility of implementing positive changes in their field. As science education leaders, we are tasked with understanding the current trends in science education; making decisions on current trends based on evidence; and implementing instructional practices to reflect changes in science education. The Leadership Strands for the 2018 Leadership Summit and additional professional development series are designed to equip science leaders with the tools and resources to tackle the grand challenges in leading effective science education in an ever-changing system. Continue checking here for more information. 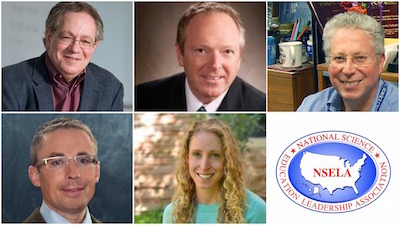 View the NSELA 2018 Leadership Summit schedule & directory. If you must cancel your conference registration, please notify the NSELA office immediately. Cancellations must be made in writing (either electronically or by mail) and must be received no later than February 20, 2018.